Our annual Sporting Legends Charity match took place this year at Cambrian FC. This was the 3rd occasion the campaign has held a charity match in Wales. The Sporting Legends team again took on a Football Association of Wales XI with the series tied at 1-1. 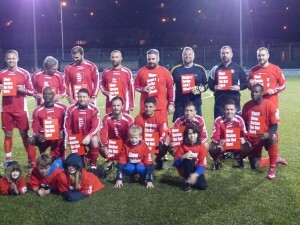 The match aimed to raise the awareness of anti-racism in the community along with celebrating the campaigns progress over the last year and our partnership with FAWales. Over 70 people turned out to support the event and to watch the Legends in action. The legends featured a strong side littered with ex-professional players including Roger Gibbins, Steve Jenkins, Damon Searle, Lee Jarman, Andy Legg, Christian Roberts and captain Lee Trundle. The legends started the game strongly with Christian Roberts breaking behind the FAWales backline and rounding the goalkeeper to slot home to take an early lead. Lee Jarman played a superb angled ball again behind the FAWales defense, that was met by a good run from Andy Legg, Andy unselfishly laid the ball off to Newport & Cardiff Rugby player Nathan Palmer who was in the right place to comfortably pass the ball into the net. Legends took a 2-0 lead. With the Legends team dominating the possession and having a comfortable 2-0 lead they continued to push on and their efforts paid off again when Christian Roberts pass deflected off a FAWales defender into the path of Tom Ramasut who took a quick shot at goal only for it to be deflected back to him where he managed to tap the ball into the net. Legends lead 3-0. Shortly after the referee blew his whistle for halftime. The Legends led 3-0 going into the break having shown some professional class during the first half. During half-time excited youngsters were able to take on the ‘Speed Gun Challenge’ organized by Gam On Wales. The contest uses a gadget, which records the speed of the participants shot electronically. Local boy Ryan Wheeler, won the contest with a 50mph strike that won him a shirt signed by Gareth Bale the rest of the Wales squad that recently faced Cyprus at the Cardiff City Stadium. FAWales were out onto the pitch early after the break with the Legends following later on content with their first half display. Three changes were made at half time for the Legends with Steve Jenkins, Andy Gorman and Jason Webber coming on. FAWales started the better team in the second half no doubt disappointed with their first half display. Their hard work paid off early on with a break through making it 3-1. FAWales continued to threaten the Legends tiring defence and managed to pull another goal back with a suspect offside. 3-2. The Legends team were now digging deep and showing more possession and opportunities with Lee Trundle showing his class creating some chances cutting in from the touchline but firing wide. FAWales broke against play and managed to equalize with a good worked goal. With the game tied at 3-3 and looking like going straight to penalties the Legends team were all looking to their captain for some inspiration. In a tense finale, the Legends won the game in the dying seconds with a strike from Lee Trundle, to crush the resolve of the FAW side 4-3. Tundle for the 2nd consecutive year was presented the Sporting Legends Charity Match trophy by campaign manager Sunil Patel. Game On Wales Manager Jarred Harvey said. “The event was a fantastic occasion, and something myself and all the Game On staff were proud to be apart of. We have worked in partnership with SRtRC for a number of years now, providing activities and events for youngsters from former Coalfields Communities, which are in some the most rural, deprived valleys in South Wales and largely populated BME communities in Cardiff, Newport & Swansea. These specific events are designed to bring youngsters together from all different Religions, Race & Social Standings to aid understanding of Racism, but above all a positive learning – cultural experience. In the two years we have been running these activities we have seen a massive increase in participation figures and as a result many new friendships have evolved during this time”. The match was a big success again this season. Next years match will be taking place at Merthyr Town FC. We would like to thank everyone involved in supporting the match at Cambrian FC, especially FAWales. Follow us on Twitter @theredcardwales to be kept up to date with our work in Wales and to find out about next years Charity Match. Video highlights to follow. Watch this space.